a tool that lets me plug in coordinates, a year and an emissions scenario and get a map of climate analogs and their associated ecosystems. Looks like someone else was reading Colin’s papers and thinking along the same lines! This week, Fitzpatrick and Dunn published an online map that lets you look at cities and their future climate analogues and along with a paper in Nature using the sigma dissimilarity metric that Colin et. al developed. Be sure to turn on the climate similarity map option when you use Fitzpatrick and Dunn’s tool – it’ll show you how analogous the closest analogue city really is! Seattle is Vancouver’s closest analogue, but it’s not a good one. You’ll have to read this paper by Colin et al. on novel climates in BC forests to find out why! How fast did Pinaceae ranges move in the past? A few years ago, Alejandro Ordonez and Jack Williams published a study comparing the speed of range migration to the speed of climate change during 6 periods of change in the last 16,000 years. Jacquelyn Gill described the paper with a bit of context. They found that northern (leading) edges expanded more rapidly than southern (trailing) edges, and that tree velocities were as fast or faster than the climate velocities for the same interval. They found that not only were tree range shifts paced by climate change in general, but that biotic velocities were faster when climate change was more rapid. Populations at the leading edge were more sensitive than the trailing edge to climate change, suggesting that expansions were climate driven but mortality at the trailing edge was affected by non-climatic factors like biotic interactions. As Ordonez and Williams note, their velocity estimates (-1.7 to 2.7 km/decade) are on the low end of previous pollen-based estimates (1-10 km/decade), but slightly higher than those estimated by McLachlan et al. (<1km/decade). Meanwhile, Loarie’s climate velocity estimates for the next century are higher, ranging from 0.8 km/decade to 12.6 km/decade. To complicate matters, species have been documented to reach average velocities of 6.1 km/decade or 16.9 km/decade in response to the climate change observed in the last few decades. This is relatively encouraging as far as expectations for trees under current climate change – ranges often expanded northward as fast or faster than the climate changed, and stuck around for awhile in the trailing edge. So far, though, it doesn’t look that rosy this time around. Their dataset included 30 plant genera, mostly woody angiosperms. Since we mostly work on Pinaceae in the Aitken lab (but see here), I pulled out those genera for a closer look. These graphs show latitudinal biotic velocity vs. latitudinal climatic velocity. Positive values are northward movement and negative values are southward. In general, the biotic velocity is ahead of the climatic velocity, though the fastest they seem to go is about 2km/decade – not exactly a rapid clip. I wonder what’s going on with the negative climate velocities at the southern range edge. If climates to the south became more favourable, why would the range shift north? The data was published with the paper, but as a pdf. A. Ordonez was kind enough to provide me with an excel copy. Code used to generate graphs can be found here. If you want to know more about the hotter droughts mentioned in Colin Mahony’s post a few weeks ago on forest management strategies under climate change mega-disturbances, you might be interested in this recent paper from Allen, Breshears, and McDowell on expectations for forest drought mortality. A review paper published last month in Science highlights the threats to temperate forests posed by anthropogenic global warming. Millar and Stephenson (2015) in particular focus on climate-change-related “hotter droughts”, compound stressors, and “megadisturbances” that can cause the collapse of forest ecosystems and interruption of ecosystem services such as water, biodiversity, and wood products. In light of the ongoing mountain pine beetle epidemic, this is not an abstract future scenario for British Columbian forests and the communities that depend on them. One of the figures in Millar and Stephenson (2015) is particularly pertinent to the work we do in the Aitken lab. 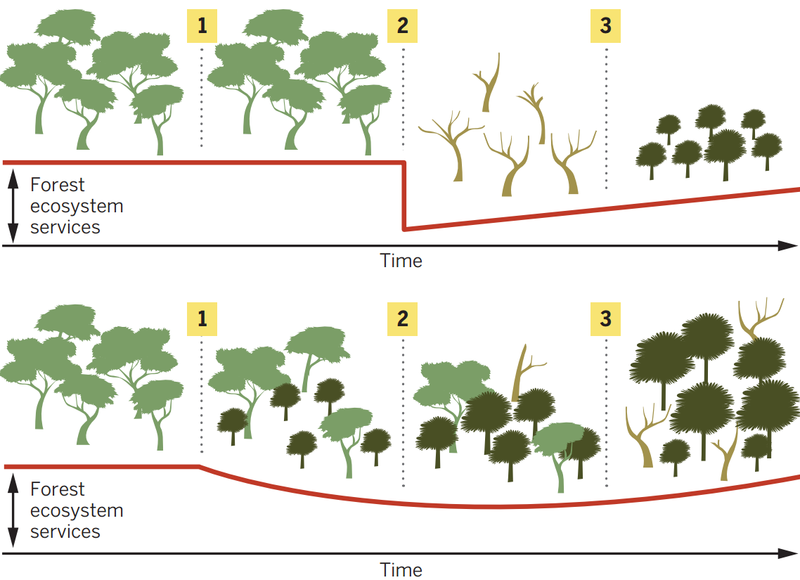 It illustrates two contrasting management approaches: the first, “reactive”, approach aims to maintain ecosystem services at historical levels by protecting the existing ecosystem structure and function; the second, “proactive”, approach accepts lower ecosystem services in order to facilitate a transition to a more resilient ecosystem state. The “reactive” approach is prone to sudden collapse of the ecosystem and its associated ecosystem services, with slow subsequent recovery to a new set of ecosystem services; the “proactive” approach aims to achieve a gradual transition in which ecosystem services are continually available, though at reduced levels. A proactive management approach is obviously desirable, but achieving it in practice will likely prove to be difficult. The proactive forest managers in this illustration chose the right species for the future climate. Would that choice be so obvious in reality? Informing appropriate reforestation strategies for uncertain future climates is an overarching goal of our research at the Aitken lab. We focus on understanding how existing populations of trees might be adapted to a range of anticipated future climates of their source locations, or of new locations where they may be better adapted. In the illustration from Millar and Stephenson (2015), a different species is introduced to the ecosystem. The Aitken lab generally investigates a more intermediate approach, in which seedlings from a non-local population of a native tree species are introduced to harvested stands. The same principal applies, however: diversity is the simplest hedge against uncertainty. All the better if the composition—the species and genotypes—of this introduced diversity is well-informed. Millar, C. I. & Stephenson, N. L. (2015). Temperate forest health in an era of emerging megadisturbance. Science, 349(6250), 823–826. Time for Trees to Pack Their Trunks? During the last two springs, contract planters for The Nature Conservancy have spread out through the pine, spruce and aspen forest of northeastern Minnesota. Wielding steel hoedads, they have planted almost 110,000 tree seedlings on public land. What’s noteworthy about planting trees in a forest? Usually foresters plant seedlings grown from seeds harvested nearby, on the assumption that local genotypes are best suited to local conditions. But these TNC workers were planting red and bur oak (which are uncommon in northern Minnesota) from seed sources more than 200 miles to the southwest, and white pine from as far away as the Lower Peninsula of Michigan, 400 miles to the southeast. TNC is anticipating a day soon — within the lifespan of a tree — when a changing climate may make the forest unsuitable for some tree species and varieties that now live there.